An investment seminar on India's Gujarat will be held at JW Marriott Seoul in Banpo-dong on Sept. 13 (Thursday), 2018 with the participation of the Indian business delegation headed by Mr. Mukesh Puri, principal secretary of the Indian State. The "Seminar on Investment Opportunities in Gujarat, India" will begin at 2:30 p.m. on the day. 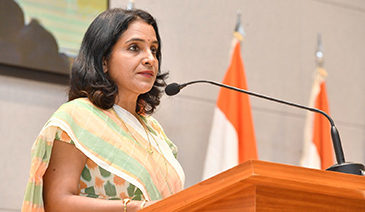 The newly arrived Indian Ambassador to Korea Sripriya Ranganathan will make a special speech right after Mr. Vasudev Tumbe, chairman of the Indian Chamber of Commerce in Korea (ICCK) delivers a welcome address. The overall presentation on "Destination Gujarat" will be made by Puri. The detailed presentations of each business sector will also be made by other members of the Indian business delegation. The Investment seminar will be hosted jointly by the Indian Chamber of Commerce in Korea (ICCK), Korea Trade-Investment Promotion Agency (KOTRA), the government of Gujarat, and Embassy of India in Seoul. The seminar is a part of the "Vibrant Gujarat Roadshow." It will be a good occasion for the local Korean businesspeople to meet with high-level government officials and high-profile business executives from the Indian State of Gujarat. The presentations will be on investment and business opportunities in Gujarat and discussions will be made on bilateral trade opportunities. Those who want to participate in the seminar need to register their name by leaving their Email at events@indochamkorea.org no later than Sept. 10 (Monday), 2018. ICCK said that they welcome anybody who are interested in investment opportunity forum with Gujarat and who want to discuss with them their business opportunities. Gujarat is the 7th largest province of India located in the western part of the country. It is widely seen as one of the most industrialized states in India with a GDP growth rate of around 10 percent over last few years. Gujarat’s key strengths include its strategic location, excellent infrastructure, proactive & stable governance and entrepreneurial spirit of its people, thus making it a perfect ground for doing business in India. Vibrant Gujarat, a highly successful biennial global investor summit organized by the Government of Gujarat, is an event that brings together global thought leaders, policy makers, academia and industrialists on a common platform to brain storm on issues of prominence, define growth agenda, and promote balanced & sustainable growth. The 8th Vibrant Gujarat Global Summit, held in January 2017, witnessed participation from 25,000+ delegates from 100+ countries, including 4 Heads of States, Nobel Laureates, Captains of global industry and Thought Leaders. 16:30: Opportunities in the mass transport system by chief general manager, Metro Link Express for Gandhinagar and Ahmedabad (MEGA) Co. Ltd.